Today's agricultural feed cultivation for cattle, pigs and chicken comes with tremendous impacts for the environment and climate, including deforestation, greenhouse gas emissions, biodiversity loss and nitrogen pollution. Cultivating feed in industrial facilities instead of on croplands might help to alleviate the critical implications in the agricultural food supply chain. Protein-rich microbes, produced in large-scale industrial facilities, are likely to replace traditional crop-based feed. A new study now published in the journal Environmental Science & Technology now estimates the economic and environmental potential of feeding microbial protein to pigs, cattle and chicken on a global scale. The researchers find that by replacing only 2 percent of livestock feed with protein-rich microbes, more than 5 percent of agricultural greenhouse gas emissions, global cropland area and global nitrogen losses could each be decreased. "Chicken, pigs and cattle munch away about half of the protein feed cultivated on global croplands," says Benjamin Leon Bodirsky, author of the study from the Potsdam Institute for Climate Impact Research (PIK, member of the Leibniz Association). Without drastic changes to the agro-food system, the rising food and animal feed demand that comes with meat-based diets will lead to continuous deforestation, biodiversity loss, nutrient pollution, and climate-impacting emissions. "However, a new technology has emerged that might avoid these negative environmental impacts: Microbes can be cultivated with energy, nitrogen and carbon in industrial facilities to produce protein powders, which are then fed instead of soybeans to animals. 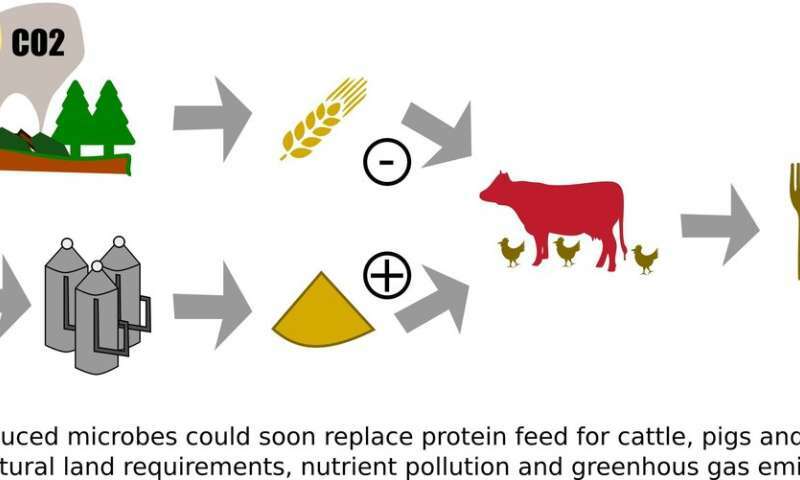 Cultivating feed protein in labs instead of using croplands might be able to mitigate some environmental and climatic impacts of feed production. And our study expects that microbial protein will emerge even without policy support, as it is indeed economically profitable," he says. The study is based on computer simulations that assess the economic potential and environmental impacts of microbial protein production until the middle of the century. The simulations show that globally between 175-307 million tons of microbial protein could replace conventional concentrate feed like soybeans. So by replacing roughly 2 percent of the livestock feed, pressure on deforestation agricultural greenhouse gas emissions and nitrogen losses from cropland could be decreased by more than 5 percent—namely 6 percent for global cropland area, 7 percent for agricultural greenhouse gas emissions and 8 percent for global nitrogen losses. "In practice, microbes like bacteria, yeast, fungi or algae could substitute protein-rich crops like soybeans and cereals. This method was originally developed during the cold war for space travel and uses energy, carbon and nitrogen fertilizers to grow protein-rich microbes in the lab," explains Ilje Pikaar from the University of Queensland in Australia. For their new study, the researchers considered five different ways to breed microbes: By using natural gas or hydrogen, feed production could be completely decoupled from cultivating cropland. This landless production avoids any pollution due to agricultural production, but it also comes with a huge energy demand. Other processes that make use of photosynthesis by upgrading sugar, biogas or syngas from agricultural origin to high-value protein result in lower environmental benefits; some eventually even in an increase in nitrogen pollution and greenhouse gas emissions. "Feeding microbial protein would not affect livestock productivity," says author Isabelle Weindl from PIK. "In contrast, it could even have positive effects on animal growth performance or milk production." But even though the technology is economically profitable, the adoption of this new technology might still face constraints such as habitual factors in farm management, risk aversion towards new technologies, or lack of market access. "However, pricing environmental damages in the agricultural sector could make this technology even more economically competitive," says Weindl. "Our findings clearly highlight that the switch to microbial protein alone will not be enough for sustainably transforming our agriculture," says co-author Alexander Popp from PIK. To reduce the environmental impact of the food supply chain, major structural changes in the agro-food system are required as well as changes in human dietary patterns towards more vegetables. "For our environment and the climate as well as our own health, it might actually be another considerable option to reduce or even skip the livestock ingredient in the food supply chain. After further advances in technology, microbial protein could also become a direct part of the human diet—using space food for people's own nutrition."